In support of engineers and managers whose judgment is essential to high-quality, innovative products, Intelligent Light has released FieldView Version 15 and a new CFD viewer called XDBview. Going beyond the limits of traditional presentation, this new FieldView release gets to the heart of elucidating and uncovering the most important patterns in the behavior of fluids and sharing these insights. Potent new colormaps and rapid access to multi-windows layouts help bring clarity and context to complex flow behaviors. FieldView 15 allows users to customize their interface with user-defined colormaps and provides visibility into each colormap from the selection menus. New colormaps with linearly varying luminance provide better insight, print well even in black & white, and remain clear even for those having trouble seeing colors. New colormaps in FieldView 15 draw out flow features. In this image, enhanced luminance colormap improve perception for all audiences, including those with color perception limitations. – FieldView image by Intelligent Light, data courtesy of Navistar. 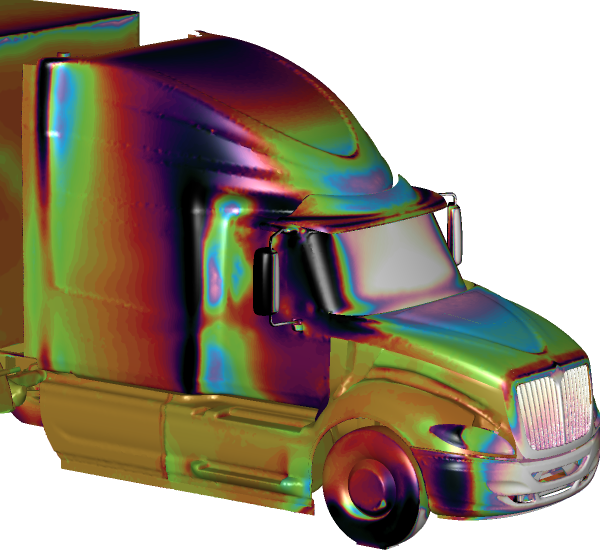 "Spectrum style colormaps are commonly used for CFD results visualization but are inherently limited because they use fully saturated colors for their entire scale. This can cause variations in lower gradient regions to be lost”, says Yves-Marie Lefebvre, FieldView Product Chief at Intelligent Light. “To address these limitations, we decided to start promoting the use of scales linearly varying in luminance. FieldView 15 introduces new colormaps with scales that are linearly varying in luminance, providing better representations that are interpreted more easily." User response to these changes has been terrific with rapid adoption and broad appeal. Among the new colormaps are schemes that enhance the effectiveness of presentation. Up to 1 in 12 consumers of visual data may be limited in their color perception abilities. The new “achromatic vision” colormaps draw out significant patterns in the data while presenting in a way that is meaningful to those with color blindness and for those with full-spectrum vision. FieldView multi-windows allow users to simultaneously compare multiple datasets or multiple views. FieldView 15 adds new Layout RESTART templates for multi-windows that make it easier than ever to layout commonly used views including 3 window formats where two datasets are displayed simultaneously with the numerical comparison between them. Users with large models will benefit from a reduced memory footprint for graphics operations. An updated OpenFOAM reader improves both performance and accuracy while reducing read times. New data reader for FLOW-3D version 11 brings users up to speed with FieldView parallel computation and parallel partitioned file read capabilities to dramatically reduce read in and computation times. Every FieldView license supports the use of at least 8 processor cores and FLOW-3D users will now benefit from this capability. Intelligent Light’s commitment to high throughput CFD workflows using XDB extract files supports our customers pursuing in-situ post-processing of very large, unsteady data. In-situ post-processing is performed directly on the solution in memory as it is generated rather than writing traditional solution or post-processing files. Users of the ultra-scalable VisIt code are exporting persistent, compact XDBs directly from VisIt 2.8 during in-situ post-processing and using these with FieldView for high-performance interrogation and visualization. The in-situ approach maximizes throughput and makes results available to analysts as the simulations are developing. The right image or animation will provide a window into fluid behaviors, but interactive exploration by consumers of CFD results increases understanding. The ability of reviewers and collaborators to achieve insights can speed a projects development and improve decision making. XDBview is a free viewer for XDB files that gives colleagues and entire communities the ability to review results of large simulations interactively, with FieldView performance, and without a post processing license. Portability – Work with your data anywhere and share your results with clients, colleagues, and managers. "XDBview is bringing CFD results to the decision makers: managers, team leaders, CFD customers,” says Lefebvre. “They can finally visualize and compare many large simulation data on their laptops, even when their results are transient." CFD users are embracing the use of XDB files because they solve many problems related to the size and complexity of CFD data which have long made it impractical to move for post-processing and collaboration. XDB files are compact extracts that maintain the full numerical fidelity of your CFD simulation on selected surfaces and streamlines. XDBs are 10x to 1,000x smaller than your CFD dataset and can be easily transferred, shared and archived. Use XDBview to efficiently share the important insights from your results. Winners of multiple HPC Innovation Excellence Awards, Intelligent Light provides industry-leading software and services that unlock the power and value of a highly productive CFD workflow for engineering and research organizations in a variety of industries around the world. The company’s flagship FieldView™ product line is the most widely used CFD post-processing software for engineering and research, encompassing data management, workflow automation, visualization, and more. Intelligent Light’s expert staff provides production-related engineering services, while its Applied Research Group conducts pure research on the cutting edge of CFD science. With customer success its paramount goal, Intelligent Light is driving real-world solutions to the toughest challenges in CFD today.